"The undermentioned method is persued in chalking land, and the persons employed therein follow it as a trade: a spot is fixed upon nearly centrical to about six acres of land tobe chalked; here apit, about four feet in diameter, is sunk to the chalk, if found within about 20 ft from the surface; if not, the sinkers considering that they are on an earth-pillar, fill up the pit, and sink in fresh places, till their labour is attended with better success. The pit from the surface to the chalk is kept from falling in by a sort of basket-work made with hazel, or willow rods and brushwood, cut green, and manufactured with small boughs and leaves remaining thereon, to make the basket work the closer. The earth and chalk is raised from the pit by a jack rowl on a frame, generally of a very simple and rude construction: to one end of the rowl is fixed a cartwheel, which answers the double purpose of a fly and a stop; an inchrope, of sufficient length, is wound round the rowl, to one end of which is affixed a weight which nearly counterbalances the empty bucket fastened to the other end. This...., a spade, a shovel, and a pick-axe, are all the necessary implements in the trade of the company of chalk-diggers, generally three in number. The pitman digs the chalk and fills the basket, and his companions alternately wind it up and wheel its contents upon the land: when the basket is wound up to the top of the pit, to stop its descent until emptied, the point of a wooden peg, of sufficient length and strength, is thrust by the perpendicular spoke in the wheel into a hole made in the adjoining upright or standard of the frame, to receive it. The pit is sunk from 20 t0 30 feet deep, and then chambered at the bottom, that is the pitman digs or cuts out the chalk horizontally, in three seperate directions.....One pit will chalk six acres, laying on sixty loads to an acre; if more be laid on, and to the full extent of the chalking viz 100 loads, then a proportional less extent of land than six acres is chalked from one pit. Eighteen barrowfulls make a load, and the usual price for chalking is 7d per load, all expenses included; therefore the expense of chalking at 60 loads per acre, is £!. 15s; and at 100 ditto, £2.18s 4d;"
....."take the present repairs of the said Farm upon himself and perform the same according to the Estimates thereof lately taken, such repairs to be completed in good and substancial manner by or before the 24th June next. The said William Turner being also allowed to use the materials from the Old Barn to be pulled down & the building at the End of the House as far as they go and having sufficient Timber assigned for the New Barn Floor & new Lathing where necessary & for Gates and Posts & such weathering Boarding and paling as the materials above mentioned will not supply." 1807 – Charlotte Grimston, 1st Countess of Verulum, made a sketch of a cottage on Leverstock Green. This is now held at HALS ref: D/EV/F98. [ A2A ] It is difficult to be absolutely certain where the cottage (singular) was or possibly still is, though an educated guess can be made. The pencil sketch shows a single cottage with a picket fence running in front of it, and a small girl standing at the gate to the cottage. The shadowy figure of a women can be seen inside the cottage, through the open doorway. The front of the cottage as it faces the green is single storey, with a double casement window and diamond shaped leaded lights in the centre. The roof holds a small dormer window, with two casements, again showing leaded lights. A large brick chimney stack is built on the right –hand end of the cottage. A lean-to outshut projects behind the chimney stack. To its right is a small wooden barn. The entrance door, immediately in front of the chimneystack, is to the side of the cottage. 1813- Under the Toleration Acts of 1688-1852 a place was registered for dissenting worship somewhere in Leverstock Green. Members of the Tarbox family ( this registration was witnessed by Humphrey Tarbox), were later buried in Leverstock Green Churchyard, as despite there being a Baptist chapel in the village from 1841, the registered burial ground was on the Church of England premises. 4th December 1813 - William Holinshead of Kettlewells died. 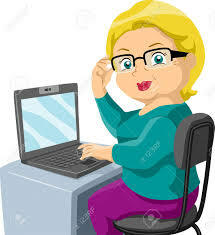 In accordance with the laws on legacies and duties of revenue at this time, his estate ( i.e. all the farm stock both live and dead 1) was sold and duties payable. The total estate was valued at £4191 19s 3d and duty of £41 18s 4d paid on March 25th 1815. (see entry for that date.) [S343, S340] Click here to find out more about the Holinshead family. 25th March 1815 - This was the date on which the Duty on the residue of the Personal Estate of William Holinshead of Kettlewells was paid. 2 The official form (held at the Dacorum Heritage Store) stated that it was "An account of the Personal Estate of William Holinshead late of the Parish of St. Michael in the County of Hertford Farmer - who died on the 4th day of December 1813 exhibited by William Holinshead of the said Parish of St. Michael Miller one of the sons and the administrator of the deceased.."
“A large house of brick & tile divided into two tenements; one containing a kitchen, back house, three sleeping rooms, and a store room; and the other, one room below and one above, yard, two gardens, barn stable and cart house boarded and tiles; and the total came to just over 3 acres with timber to be taken at valuation at the time of the sale." Photograph of sketch taken by Barbara Chapman. Published here with the kind permission of Hertfordshire Arhcive & Local Studies. 29th June 1824 - John Groom, corndealer, acquired a seven year lease on Leverstock Green Farm. "Christopher Thomas Towers hath demised leased and farm letten All that Messuage or Tenement Farm and Lands......64 acres more or less.........late in the occupation of Isaac Turner now of the said John Groom." John Groom had to "effect repairs within three months" of being told they were necessary. The annual rent was to be £64, i.e. £1 per acre - this rent having remained the same since 1797. In addition to his annual rent of £64, John Groom had to pay a further £20 per acre for any meadow or woodland which he dug up and tilled, and an additional £10 per acre "for every acre of arable land cropped contrary to the course of husbandry herafter prescribed." 1. He was allowed to sell the wheatstraw. 2. He was "Not to let any turnips stand for seed but to feed them off with sheep on the land wherever they grow." 3. He was "Not to Cross crop any of the said arable land." 4. He was to "cultivate so that in any 1 year there was no more than 26 acres of wheat, oats, barley, or rye, nor was there less than 13 acres of Clover layer or artificial grasses"
5. "Such lands to be sown with turnips or vetches to be fed off or may be clean fallowed but on no account cropped in any other manner." 6. He was to "Ash his Clovers and soot such of his wheat crops as have not been dunged in the previous year." 7. He was to "dung his meadow or pasture ground well." 8. He was "not to cut the underwood in the wood called Fox Howletts till January 1st 1825 nor of the wood called Hobbs Hill till after January 1st 1826". It is interesting to note that the woods were refered to as Hobbs Hill for the first time, and not Hobb Gill or Hobb Jo. As late as the present time elderly residents of the area still refered to the woods as Hobb (pronounced'obb) Gill or Hobb Jo. I believe the name Hobbs Hill came about by a clerk miscopying the name from an older document. 9. He was to be fined £5 a tree for any tree or pollard cut down. 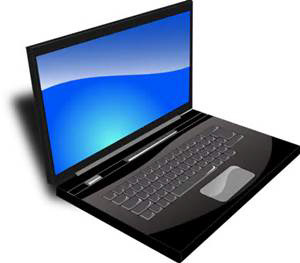 \_ [from Scope and Content] Examinations and depositions: Information of Jn. Roberts, Leighton Buzzard, blacksmith; missed a cast iron wheel which he had left in Jn. Proctor's rickyard. Hearing that Jas. Stevens, dealer in old iron, of Leighton Buzzard, had lately been in the Hemel Hempstead area with a cart and two donkeys, he went to the house of Jos. Harris, Leverstock Green, there, who was a farmer and dealer in rags and old iron and found approximately half of the wheel. Harris said he had bought it from Stevens and also a wrought iron spindle, which Roberts also claimed. These cottages made up Lot 2 in a series of 11 lots to be sold by auction by Mr. Page; Land agent, auctioneer and valuer. 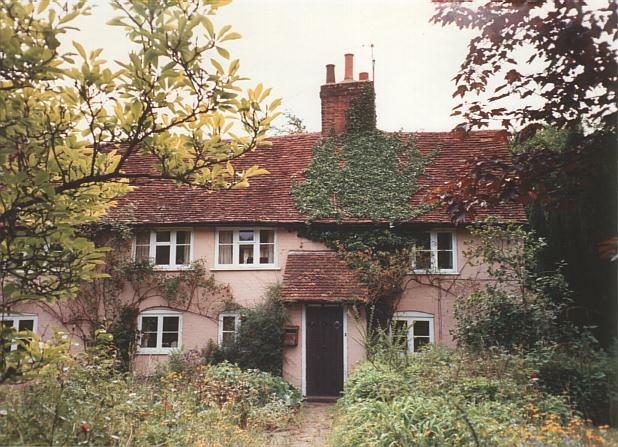 The sale was to start at 2 p.m.
"Three timber and tiled freehold messuages, situated at Westwick Row, in the parish of St. Michael in the county of Hertfordshire. With good Gardens, Barn, Pig-sties, Oven, Well of Water and a large orchard, containing by estimation half an acre, in the several occupations of Martindale, Sears and Coleman; at the very low old Rents of £17 per annum. Land Tax Redeemed." "This lot is situate in a GOOD neighbourhood, and the spot well calculated for a private residence, being capable of great improvement at a small expense." Written by hand in ink in the margin next to this description was the amount of £275; the sum I assume the lot of three cottages fetched at auction. (It would be interesting to know what value would be put on the cottage(s) today!!) Conditions of sale included "no person to advance less at any bidding than £5", and "that every purchaser shall immediately pay down a deposit, in the proportion of £20 for every £100 of his or her purchase money, " and...."full payment was to be made by December 24th next." If this payment wasn't made, the purchaser was liable to interest. "the Copyhold of the Property Meads - in Westy Crow (Westwick Row)- be sold." 1828 - A plan of Great and Little Cox Pond Farms, surveyed by Creed & Griffin of Hemel Hempstead in this year, is held at the County Record Office; reference AH 682. The map itself, charmingly executed shows the land belonging to the farms ( shaded in green), and the names of all the neighbouring land owners. Click here for further details of the plans and what we can learn from them, including photographs of the original documents. 26th July 1832 – An auction sale of the Copyhold of Little Cox Pond Farm took place at the Rose & Crown Inn Hemel Hempstead at 2pm. The sale was on the orders of the executors of the late Mr. Joseph Camfield. The estate was divided into five lots. [D/EX 7 T1] See seperate web-page. 14 August 1835 - The Freehold of Bottom House Farm (otherwise known as Lawrence Farm), together with Crackabone Farm and Six Tunnel Farm in Redbourne and Great Gaddesden, were put up for sale. The farms were to be sold by auction by a Mr. Hoggart at The Auction Mart , although no mention was made of where this was! The copy of the bill of sale advertising the auction describing the farm is shown on a seperate page, click here to view.Sadly, the accompanying plan for the bill of sale does not seem to have survived. 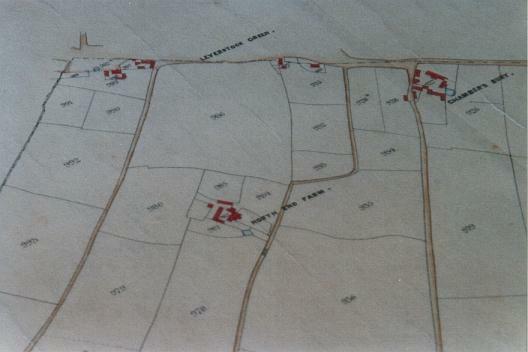 It is clear, however, from a comparison of field names listed in documents concerning Lawrence Farm, the previous name for Bottom House, from the seventeenth century, and shown precisely on the Gorhambury Estate map of 1769 and the Tithe Map for 1840, that the lands associated with the farm remained stable. The four acres of road was the stretch of Green Lane from Leverstock Green up to the farm itself, and the fields stretched from Upper and Lower Green Field (previously Upper and Lower Newlands) and the stretch of land presently occupied by the school and the houses between the school and The Leaside; right up to Broadfield, which today is occupied by the M1 and land beyond the M1. To view a map of the Bottom Farm/Lawrence Farm holding click here. John Samuel Story, agent of the Earl of Verulam, attended the auction and bought it on behalf of the Earl. Written on the reverse of one of the small handbills giving particulars of the three farms sold that day, was the following: "I the within named Charles Hoggart do hereby acknowledge to have sold, and I the undersigned John Samule Story(as Agent on the part of and for the Earl of Verulam)to have purchased this day by Auction the premises comprised in Lots 1 & 2 of the within Particulars of Sale at the Sums of Three thousand seven hundred pounds amd the said John Samuel Story has paid and the said Charles Hoggart received a Deposit of Seven Hundred and forty pounds and the further sum of Fifty Three pounds nineteen shillings and two pence for the purchasors Moiety of the Auction Duty And we eventually agree to complete such Sale and Purcheses agreeably to the within Conditions of Sale. As Witness our hands the 14th day of August 1835. C.L. Hoggart John Story." 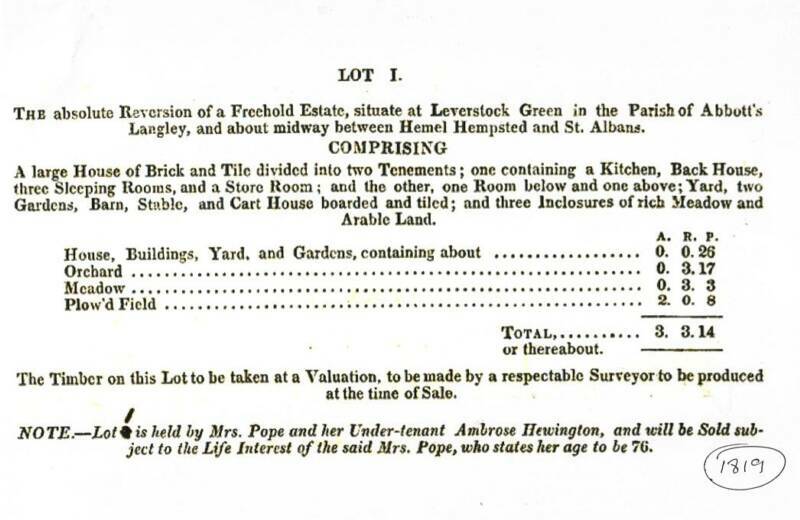 1839 - It would appear from the renewal of Henry and Joseph Smith's lease of Leverstock Green Farm, that either inflation had started to take a hold, or else land values had risen considerably. This was because the annual rent of the 64 acre farm was increased from £64 to £77 10s.0d..[HALS 80784]. 1840 – Tithe map shows there to be two cottages built on the Green (now Church Cottages) at the time, given the number 236. The apportionment says: Land Owned by John Orchard and occupied by John Barnes & another 236 Cottage & Gardens. 29th September 1840 - At the Michaelmas Session of the Court at St. Albans, an order was given to "divert, turn or stop up part of a public highway or carriage road leading from Nash Mills to Leverstock Green and Bedmont". ( A further order was made concerning a footpath from Nash Mills to Hyde Farm, Bedmond.) It would seem likely that the road in question is either Chambersbury Lane or Bunkers Lane. Bearing in mind the way Chambersbury Lane digresses from its Medieval field boundary line as it nears Nash Mills, it would seem possible that this might be the case. If the plans are still held at St. Albans I may be able to verify this. The consent of the owners of the property concerned, Charles Stratham of Amersham, and his wife Sarah (from whom the right to the said property had come) had been sought and given. A certificate of completion would be given. [ S60 ] Sessions Roll CCXIX/ 213 - 228, & Sessions Book VI/ 364 - 367. 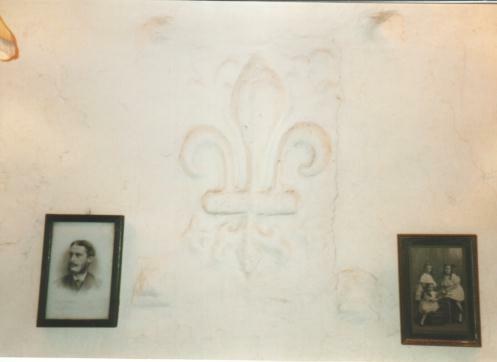 RIGHT & ABOVE: Northend Cottages as they are today, together with some of the original 16th century plaster relief work inside. BELOW: Section of the Abbots Langley Tithe Map with the cottage highlighted. Photograph © Barbara Chapman, from the original at HALS, reproduced here under license with their kind pemission.